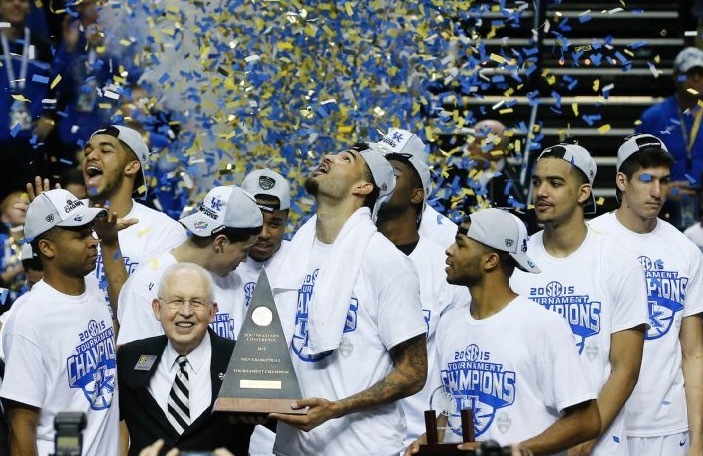 The SEC men’s basketball tournament final on ESPN where Kentucky won over Arkansas to remain undefeated topped the cable sports nets for Sunday with an average of 3.314 million viewers and a 1.1 adults 18-49 rating. The 30 for 30 documentary ‘I Hate Christian Laettner’ drew 2.319 million viewers and a 1.1 adults 18-49 rating. For those wondering how that stacked up against other 30 for 30 documentaries: ‘Requiem for the Big East’ on 3/16/14 averaged 1.456M and ‘Survive and Advance on 3/17/13 averaged 1.603M. Like the Laettner doc, those aired after the NCAA tournament selections had been made. SMU’s win over Connecticut in the AAC conference championship averaged 1.554 million viewers and a 0.5 adults 18-49 rating.